Poverty, disease and ignorance have been virtually eliminated from the Warsaw Pact states. Disobedience to the party has been virtually eliminated. Lex Luthor has been busy assembling a never-ending parade of rogues to battle the Comrade of Steel- all have met with failure. But what of the mysterious Batman from the underbelly of Moscow? Will he be the one to take down Superman once and for all? SPOILER: After the events in the previous chapter Superman is now the Russian president. The Comrade of Steel has kept his nation thriving despite the many attempts of the Americans and most prominently Doctor Lex Luthor who has sent in super soldiers to try and neutralise Superman- funnily enough represented by 'our' Earths' supervillian army. Brainiac manages to shrink Stalingrad inside a bottle city in hopes to trap Superman. Lex is less than impressed, pointing out that Superman lives in Moscow just as Superman arrives to save the day. Destroying Brainiac's ship, the Comrade of Steel returns to confront Luthor about returning Stalingrad to full size... Lex smugly explains that neither he nor Brainiac know a way to reverse the process and follows coldly with a comment that surely the superior intellect of a Superman would be able to solve a problem a mere mortal could not? Superman flies skyward in a fury while Lex turns to his computer to play a game of chess. The story moves on to the Superman Museum in Moscow many months later. Lex, is inside and disguised in a crowd. Lex is angered for while walking around the museum looking at all of the memorabilia, he listens to a guide explain how the entire world has handed itself over to Superman's control... everyone except Chile and the USA who, she points out are at the brink of collapse. "Whatever helps you sleep at night comrade" he grins. Minutes later in the museum a voice echoes through the halls. The voice of a rebel. The voice of... The Batman. The Dark Knight explains the museum will explode in four minutes and to get out if they were against oppression and valued their lives. The building explodes in a huge ball of flame but before anyone can react Batman is spotted. A thrilling chase throughout the city by the KGB begins and through the canyons of skyscrapers Batman swings dodging bullets and helicopters. Batman is suddenly shot down and his lifeless body slams to the ground... Cocky agents run to retrieve the body only to find... a dummy decoy! The Bat lives to fight another day. This is much to the dismay of the KGB leader, Pyotr. Promptly he confronts Superman about the problem of the Bat and why the Man of Tomorrow wouldn't allow the KGB to kill the leader of the rebel army. Superman explains Stalin may have worked that way but HE doesn't. 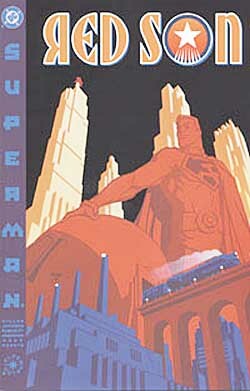 The argument of methods is cut short as Superman flies off to rescue a train in danger. While doing so he admits to himself that he grows bored of humans and that he can only really relate to his old friend Diana... Wonder Woman. Diana tells Superman of her time in America and how she had failed to get the nation to see 'sense' join the utopia... Superman explains he feels that maybe humanity rely on his help a little too much. Nobody wears seat belts or takes any other precautions anymore. Perhaps people don't even like him he points out. "Oh, the people LOVE you Superman. Some more than you'd ever believe" she says sighing. Reads a banner across the Daily Planet newsroom. Perry White is leaving the great metropolitan newspaper but not before he offers the new editor, Lois Lane, some advice. Get a husband that cares for you. Not one that's intent of destroying Superman. This sets Lois thinking and on the day of her 23rd anniversary she visits Lex in his giant laboratory. He is too busy to spend any time with his loving wife and instead of showing affection he explains Agent Olsen has discovered Superman and Brainiac were not the only aliens to visit Earth. Something crash landed in Roswell in 1947... something that may turn the tide in the US' favor. An alien passenger who died after the crash was wearing an amazing piece of jewellery... something Luthor is VERY interested in. The story continues after the Superman rescues a team of cosmonauts from an exploding space station. When Pyotr wakes up he's warm, dry, alive and... in the Batcave! Pyotr and Batman form an uneasy alliance to aid the Americans to take down Superman. Suddenly the voice of Wonder Woman alerts the amazing hearing of Superman. The Amazon has been captured by Batman in Siberia and soon the Comrade of Steel arrives for the confrontation. Superman laughs at Batman's booby traps and through his smugness... misses out on a red sun generator. Suddenly Superman and Batman are physical equals... a blood filled fight ensues and even Wonder Woman joins the fray. When Superman is beaten and captured the mighty amazon comes to his aid and smashes the red sun generator into tiny pieces. Powered up again Superman confronts his enemy but before he can be taken down- in a flash Batman is reduced to dust... rather than hand himself into Superman he sets off one final booby trap- a bomb in his chest. But before Batman dies he annouces that Pyotr was the man who orchestrated the plan. Pyotr reveals Superman had left a reprogrammed Brianiac in charge while he had been building something. Art - 5: Brilliant artwork and special effects in the story, they compliment one another very well. Sad that the artwork, like the story wasn't given enough time to shine properly. MORE full page spreads! MORE action! let the artwork take centre stage too!